Eggs don't feature all that often on my menus, but when they do, I enjoy spicing them up. My latest egg curry was served up for a light dinner when I wanted something protein packed but not terribly time consuming. 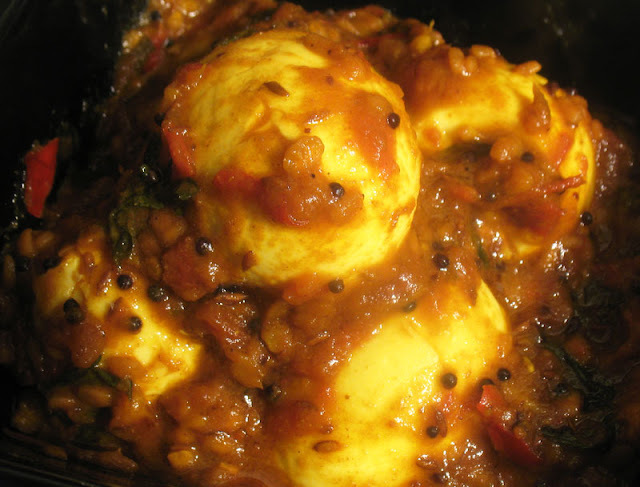 Hard boiled eggs are here served smothered in a spicy and tangy tamarind based tomato sauce with urad dal. 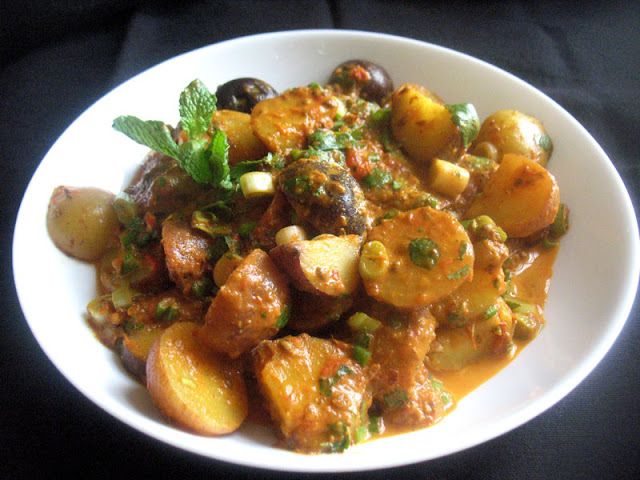 The addition of tamarind adds a pleasant sweetness to the curry, with texture from the urad dal and some zestiness from the tomato. The ingredients can be prepped while the eggs are boiling. Once the sauce has thickened, the eggs are folded in, warmed and served up in hardly anytime at all. If desired, serve some rice on the side. Begin by boiling the eggs. Cover the eggs with water in a medium saucepan and bring to a boil. Boil for 8 minutes, and then plunge the eggs in ice water. Let sit for 10 minutes, then remove from the water, peel, and set aside. Meanwhile, soak the tamarind pulp in the boiling water for 30 minutes. Strain, reserving the soaking liquid, pressing out as much liquid from the pulp as possible. Discard the pulp and set the water aside. In a medium saucepan, heat the oil over medium heat. When hot, add the mustard seeds, cumin seeds, fenugreek seeds and urad dal. Stir and fry until the mustard seeds turn grey and begin to splutter and pop. Add the chilies, ginger, spices and asafetida, and stir and fry for another minute or two until fragrant. Stir in the tomato, tamarind water and salt. Simmer for 5 to 10 minutes until thickened. Add the eggs, stir to coat, and gently simmer for a few minutes to heat throughout. Garnish with fresh parsley and serve. I could get into eating eggs this way Lisa. This sounds great! What quantity of tamarind paste would you recommend as a substitute for the tamarind pulp? Hi Mark. I would use the same amount of tamarind paste, maybe a little less, so I'm thinking about 1 tablespoon. 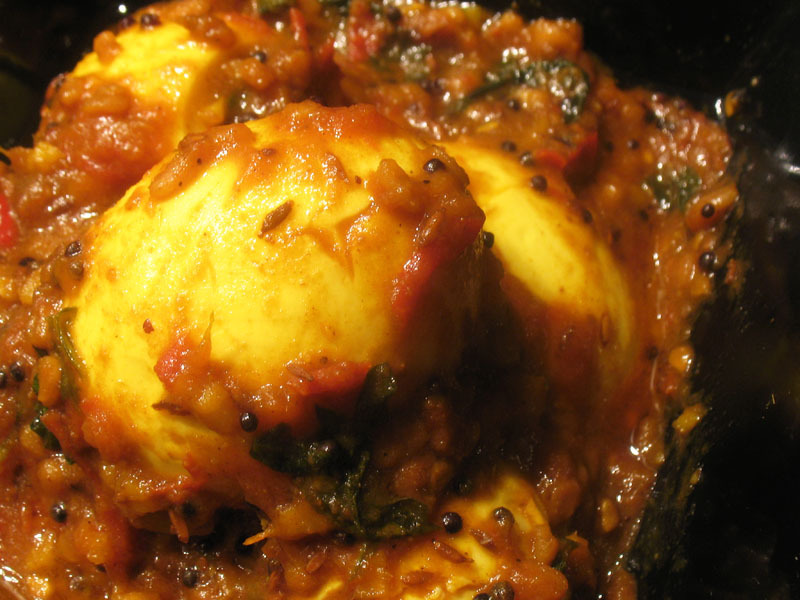 I love eggs, but have never had them in a curry! Love the sweet sour tamarind here. This curry sounds delicious! 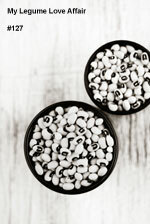 I love the idea of double protein with the rich egg and creamy urad dal. Yay!